Hospitality Lawyer and Special servicers: Busy now? Realpoint says work will double by year end! Implications for all CRE loans. This is one of many articles on the subject of “troubled hotel loans – workouts, bankruptcies & receiverships” in the rich library at www.HotelLawBlog.com. 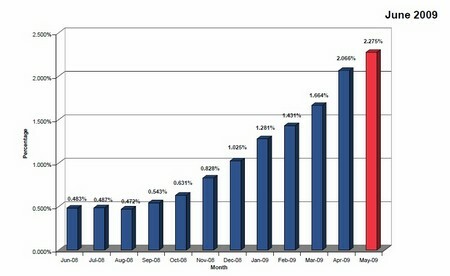 I have now had time to settle in and digest the latest June 2009, Realpoint Research report on CMBS loan delinquencies. The numbers paint a very serious and dramatic picture. A copy of the full report is attached, with my personal highlights to point out some facts I thought were particularly significant. Let me know if you would prefer a clean copy without my highlighting and lines, and I will email you a “clean” copy. The Realpoint research is directed solely to CMBS delinquencies, but we think distress in this sector (roughly one third of all commercial real estate loans) is representative of stress that will be experienced in at least another third of the CRE loans made by commercial banks, if not all CRE loans. So what does this all mean? Here are my thoughts. What’s important in the Realpoint report? In May 2009, total outstanding CMBS loan delinquencies rose $1.6 billion to $18.8 billion, more than 368% of the delinquent levels one year ago. In May 2009, delinquent CMBS loans reached 2.275% of outstanding CMBS loans, up more than 500% from one year ago — up from 2.07% one month prior, and 1.28% in January 2009. Realpoint predicts that CMBS loan delinquencies will double (exceed 4.4%) by year-end 2009, and possibly approach 5.7%. The top 3 states for delinquency exposure remain California, Texas and Florida and they represent more than 30% of delinquencies — each state accounts for about 11%, 10% and 9%, respectively of the total CMBS delinquencies. A graphic view of the new data. The following chart shows the increase in CMBS delinquencies over the past year, growing from just under .5% last June 2008 to more than 2.2% in May 2009. Now imagine it spiking to 4.4% — or possibly 5.7% — by December 2009! 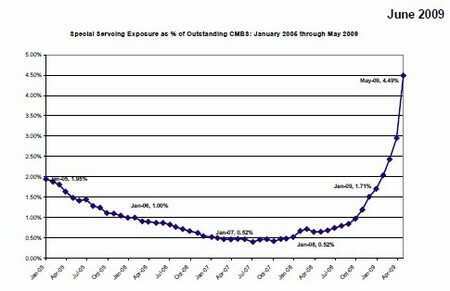 This chart shows why CMBS special servicers became so busy so fast. 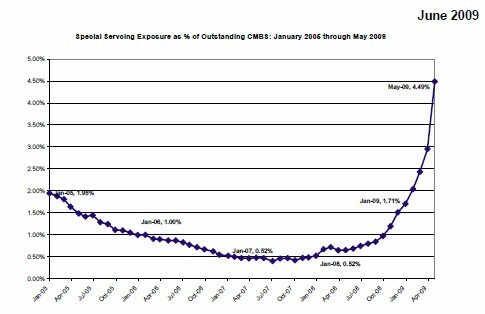 Notice the steep growth in special servicing exposure as a percentage of outstanding CMBS loans from January 2005 through May 2009. The next chart I want to call your attention to is too small to reproduce well here, but look at Table 8 in the Realpoint report which shows how CMBS hotel loan delinquencies compare to other classes. Note that delinquent hotel loans now comprise about 11% of delinquent CMBS loans, and have a delinquency rate slightly higher (2.8%) than the average delinquency rate for all CMBS loans. Similarly, look at Table 10 which lists of the top 10 states by CMBS loan delinquencies. Note that these 10 states account for more than 60% of the total loan delinquencies, and just 3 states — California, Texas and Florida — account for more than 30%, or almost half of that total. View my highlighted and marked up version of the Realpoint Research report by clicking here, or email me for a clean copy of it. It looks to me like we are headed for a lot more trouble in all commercial real estate loans, but particularly hotel loans where lost frequency and severity is climbing. More attention to these loans will protect and harvest greater value. It will be a good investment. Hotel Lawyer: Does “End of the Recession” mean “Recovery”? Not for luxury hotels! Hotel Lawyer: Some practical alternatives to hotel closings – turning around operating results. Hotel foreclosures on track to set new records in California and elsewhere. Special servicers: Busy now? Realpoint says work will double by year end! Implications for all CRE loans. Hotel delinquencies predicted to exceed 8% by year end. Red Roof defaults on $361 million in loans. Are there lessons for hotel lenders and investors in the latest California market report? What lies ahead for the hotel industry? When do values bottom? When do they recover? Hospitality Lawyer: The “amazing relationship” between GDP and hotel room demand. When the recovery comes, what will it look like for the hotel industry? This is Jim Butler, author of www.HotelLawBlog.com and hotel lawyer, signing off. We’ve done more than $87 billion of hotel transactions and have developed innovative solutions to unlock value from troubled hotel transactions. Who’s your hotel lawyer? Our Perspective. We represent hotel lenders, owners and investors. We have helped our clients find business and legal solutions for more than $87 billion of hotel transactions, involving more than 3,900 properties all over the world. For more information, please contact Jim Butler at jbutler@jmbm.com or 310.201.3526. Jim Butler is a founding partner of JMBM and Chairman of its Global Hospitality Group®. Jim is one of the top hospitality attorneys in the world. GOOGLE “hotel lawyer” and you will see why. Whether it is a troubled investment or new transaction, JMBM’s Global Hospitality Group® creates legal and business solutions for hotel owners and lenders. They are deal makers. They can help find the right operator or capital provider. They know who to call and how to reach them.